Vertical Forest is a model for a sustainable residential building, a project for metropolitan reforestation contributing to the regeneration of the environment and urban biodiversity without the implication of expanding the city upon the territory. It is a model of vertical densification of nature within the city that operates in relation to policies for reforestation and naturalization of large urban and metropolitan borders. 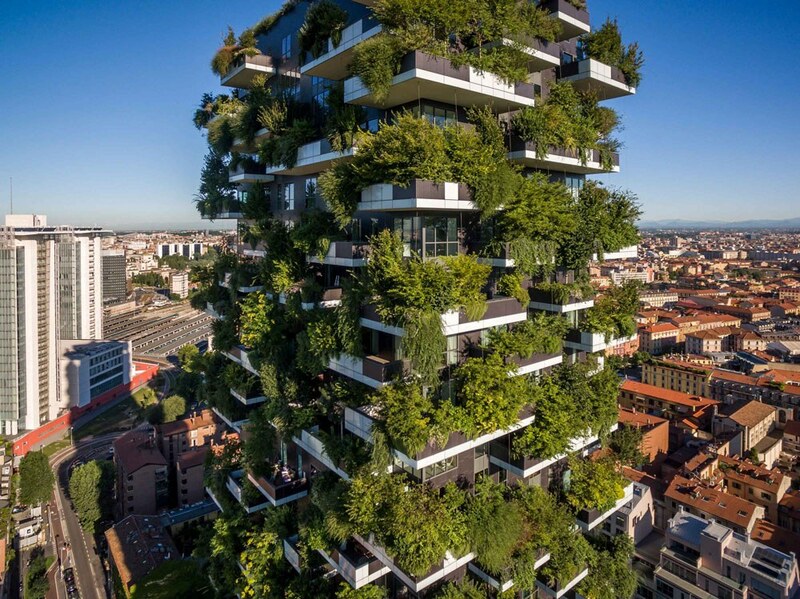 The first example of the Vertical Forest consisting of two residential towers of 110 and 76 m height, was realized in the centre of Milan, on the edge of the Isola neighborhood, hosting 900 trees (each measuring 3, 6 or 9 meters) and over 20,000 plants from a wide range of shrubs and floral plants distributed according to the sun exposure of the facade. On flat land, each Vertical Forest equals, in amount of trees, an area of 20,000 sq.m of forest. Biological habitats: Vertical Forest increases biodiversity. It helps to set up an urban ecosystem where different kinds of vegetation create a vertical environment which can also be colonised by birds and insects, and thus becomes both a magnet for and a symbol of the spontaneous recolonisation of the city by vegetation and by animal life. Anti-sprawl: Vertical Forest is an anti-sprawl measure which aims to control and reduce urban expansion. If we think of them in terms of urban densification, each tower of the Vertical Forest is equivalent to an area of urban sprawl of family houses and buildings of up to 50,000 square metres.